With herbicide resistance on the rise, there is a renewed emphasis on soil tillage as a critical component of integrated weed management. Although tillage is the subject of an ongoing debate – with studies released this month by NASA and the European Conservation Agriculture Federation emphasising the role minimising soil disturbance and building up soil carbon can play in reducing greenhouse gas emissions from farming – a newly published paper by researchers from the U.S. has backed tillage as a major means of suppressing weeds. The study stresses that, when it comes to weeds, timing matters and when tillage occurs can significantly impact both weed density and the composition of the weed community that emerges from seeds in the soil. The paper, published in the journal Weed Science, looks at the impact of tillage on four sites in the northeastern U.S. that were tilled every two weeks during the growing season. Six weeks after each tillage cycle, researchers sampled random plots – 196 in total – to measure the density and species of weed seedlings. They found that total weed density tended to be greatest when soil was tilled early in the growing season. In fact, more than 50 percent fewer weeds emerged after late-season tillage than after early-season tillage. The composition of the weed communities in the test fields was also impacted by tillage timing. After early-season tillage there was greater unevenness among various weed species, with some species clearly dominating. After late-season tillage, the distribution among weed species tended to be much more even. “Our results suggest that farmers may be able to better manage weed communities and to mitigate the impact of weeds on crop yields by adjusting the timing of their tillage, crop rotation and other cultural management practices,” says Matthew Ryan of Cornell University, a member of the research team. Full text of the article can be read here. Not running the combine through a weed patch will help limit the spreading of weed seeds throughout the field. (Above) Running a giant ragweed plant through the combine spread 1,800 seeds 30 feet or more compared to only 3 feet (below) when not run through the combine. Editor’s note: The following was written by Lizabeth Stahl, Jared Goplen and Lisa Behnken, University of Minnesota Extension educators, for the university’s Minnesota Crop News website. Weed management tools can be divided into three main categories: mechanical, cultural and chemical. Historically in conventional systems, chemical control options, or herbicides, have been relied on heavily. Herbicide-resistant weed populations, however, are limiting herbicide options and effectiveness in many fields. Implementing non-chemical options, such as cultural and mechanical control tactics, can help make weed management systems more effective and durable. Weed emergence is driven by a number of factors, including temperature, light, nitrogen and/or chilling period, depending on the species. University of Minnesota trials at Waseca in 2016 showed that delaying soybean planting until May 19 resulted in pre-plant tillage removing nearly 49 percent of the giant ragweed that emerged over the season. Soybean yield potential was still around 94 percent of optimal at the May 19 planting date, based on long-term research results, and the benefit was a much lower population of giant ragweed to control post emergence. Soybean yield potential of the early planting date averaged 99 percent of optimal, however, pre-plant tillage removed less than 8 percent of the giant ragweed emerged over the season. Pre-plant tillage can be an effective weed control tool, especially when planting is delayed. Flushes of early-emerging weeds, such as giant ragweed, common lambsquarters and winter annuals, can be taken out with pre-plant tillage, but be sure tillage is aggressive enough to destroy the weeds, and not just uproot and transplant them. In contrast, waterhemp emerges later in the season, typically emerging over an eight to 10 week time period. This is why residual herbicides or the layering of residual herbicides (e.g. an application at planting and then 30 days later) is recommended for control of waterhemp. Seed production of weeds can vary significantly by species. Giant ragweed, for example, has been found to produce from 1,800 to 10,000 seeds per plant, while waterhemp can average over 350,000. Although competition with other plants can reduce seed production, dense weed populations have the potential to produce tremendous amounts of weed seed. Common lambsquarter is a long-term survivor in the weed seedbank, and according to the University of Michigan, it takes an estimated 78 years to see a 99 percent depletion of the seedbank. In contrast, University of Minnesota research demonstrated the giant ragweed seedbank could be depleted 97 percent in two years. University of Illinois research found the waterhemp seedbank could be depleted by more than 99 percent in 4 years. Burial of seed by tillage can increase longevity in the seedbank, while seed left on the soil surface can be lost to predation and decay. For this reason, delaying tillage as long as possible in areas where weeds went to seed could help reduce long-term weed management challenges. Avoid deep tillage, which enhances seed longevity. Not running the combine through a weed patch will help limit the spreading of weed seeds throughout the field. Also, manage weeds along field edges to help prevent buildup of the weed seedbank. Ensuring the crop is as competitive as possible (e.g. adequate fertility, planting population and disease and pest control) can help enhance weed control. Narrow rows, expanding crop rotations and cover crops have the potential to aid in weed control as well. Cultivation is another effective tool, allowing you to remove weeds without setting back the canopy as some postemergence herbicides can, leading to faster canopy closure and a more competitive environment for weeds. Cultivation was evaluated in Minnesota research trials in 2015 and 2016. A preemergence application of Boundary was followed by either Liberty or mechanical cultivation. In 2016, final waterhemp control was significantly better with the Boundary/Cultivation treatment (98 percent) compared to the Boundary/Liberty program at 89 percent. Copyright 2017 Iowa Farmer Today. All rights reserved. This material may not be published, broadcast, rewritten or redistributed. Can a soybean ‘trap crop’ protect cotton from stink bugs? Soybeans were an effective trap crop, pheromone traps killed stink bugs in the trap crop, and buckwheat plants fed beneficial wasps that reduced stink bug numbers. (Gallery) Can you tell the difference between a good and a bad stink bug? Cotton growers in the United States are concerned about native stink bugs that have attacked cotton and other crops for decades. The green stink bug (Chinavia hilaris), southern green stink bug (Nezara viridula), and brown stink bug (Euschistus servus) continue to threaten cotton. But an Agricultural Research Service scientist in Georgia has found some environmentally friendly alternatives to insecticides. “Cotton growers are increasingly interested in producing their crops in ways that have less impact on the environment,” says ARS entomologist Patricia Glynn Tillman, who is based in Tifton, Georgia. The three native stink bugs are immune to the insect-killing toxins incorporated into most modern cotton varieties. Insecticides are effective, but they also kill the stink bug’s natural enemies, and they often require repeated use throughout the growing season. Organic growers can’t use conventional insecticides. Stink bugs continue to pose a serious economic threat. Last year, they collectively infested roughly a million acres of cotton in Georgia alone, and growers there spent $12 million to control them. The bugs are a particular problem in the southeastern United States, where cotton is often grown alongside peanuts. Brown and southern green stink bugs develop in peanut fields and migrate into cotton. Green stink bugs move into cotton from nearby wooded areas. Because of work by Tillman and others, some growers are planting “trap crops,” such as soybean and grain sorghum, to lure stink bugs away from cotton. Other options include pheromone-baited traps, which capture and kill stink bugs, and nectar-producing plants, such as milkweed and buckwheat, to feed native parasitoid wasps that attack stink bugs. In previous work, Tillman showed the effectiveness of setting up plastic barriers between the cotton and peanut rows. Her recent study focused on whether combining a trap crop, a nectar-producing plant, and pheromone traps would control stink bugs where cotton and peanuts grow. Tillman and her colleagues grew cotton and peanuts side by side for 2 years. In the first year, they planted soybeans as a trap crop (with and without pheromone traps), between the cotton and peanut plots. In other areas, they placed 6-foot-high plastic barriers between the plots. In the second year of the study, they added nectar-producing buckwheat plants near the cotton. Each week of the May-to-October growing season, they counted stink bugs and stink bug eggs killed by wasps, and they documented damage to cotton bolls. They found that the plastic barriers between peanut and cotton were the most effective tool, but the multipronged approach is an effective alternative if barriers are not feasible. Soybeans were an effective trap crop, pheromone traps killed stink bugs in the trap crop, and buckwheat plants fed beneficial wasps that reduced stink bug numbers. “Protecting Cotton From Stink Bugs” was published in the July 2016 issue of AgResearch Magazine. Colorado potato beetle (Leptinotarsa decemlineata). Photo by Scott Bauer, USDA Agricultural Research Service, Bugwood.org. 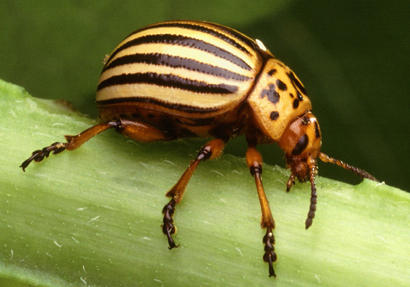 As the effectiveness of the primary chemical weapon against the Colorado potato beetle (Leptinotarsa decemlineata) starts to wane, new ways to manage this pest are needed where potatoes are intensively grown, according to an article in the the Journal of Integrated Pest Management. The beetle is a major problem in areas such as Wisconsin, Michigan, New York, and Maine. It attacks the foliage of the potato, thus interfering with photosynthesis and reducing energy that helps the potato grow. Both chemical and non-chemical methods can be used to deal with the pest, according to two of the authors — Anders Huseth, a postdoctoral associate at North Carolina State University and Russell Groves, a professor of entomology at the University of Wisconsin-Madison. Neconicotinoid insecticides have been successfully used since 1995 to fight the beetle, but their effectiveness has been waning in some areas. While resistance is increasing, Huseth notes that it may not spread to all areas where potatoes are grown. Areas where potatoes are not grown year after year on the same soil are less likely to see insecticide-resistant potato beetles. But to ward off resistance where it may become an issue, the researchers advocate moving away from broad-spectrum pesticides toward more highly targeted ones, as well as using non-chemical methods. The beetle “has a long and decorated history of developing resistance to most of the chemical classes that have been used against it,” Groves said. Hence, the researchers have devised a strategy of rotating various pesticides with different modes of action over the years in order to prevent, or at least significantly delay, the development of resistance. For example, one strategy calls for using benzoylureas — an insect growth regulator that interferes with chitin synthesis — early in the season, followed by a late-season application of spinosyn, which interferes with the nervous system. The second year would begin with an early-season application of diamide, which affects muscle contraction. The researchers also note that non-chemical, or cultural, means can be effective as well. For example, crop rotation can, in certain cases, be effective. As Groves explained, the beetles are tired after emerging from under the ground after winter. But that may be hard to do, given the location of farms and the nearby presence of housing, according to Amanda Gevens, assistant professor of plant pathology at the University of Wisconsin-Madison, who was not involved in the research. Another non-chemical approach is called the spring trap crop, which is essentially a decoy for the beetle. According to Huseth, a small “trap” crop can be planted two weeks before the main commercial crop is planted. However, Gevens cautions that this method may only be practical for small and moderate scale growers. “When you move to larger fields that may be 80 acres or greater, fields are more highly concentrated and the trap crops won’t work as well, given the quantity of potato and attractive plant material for the insect pests,” she said. While non-chemical means of controlling the beetle and other pests may be helpful, pesticides “used in a judicious way” will always be a factor in growing potatoes, according to Huseth. Farmer with basket of organic potatoes. New research shows a plastic mesh cover laid over potato crops could be the answer to fighting potato pests without using chemical sprays. Scientists at the Future Farming Centre and Lincoln University say field trials of the mesh cover is showing exciting results in controlling the tomato potato psyllid as well as reducing potato blight. The psyllid arrived in New Zealand in 2006 and can cause severe crop loss through its bacterium. 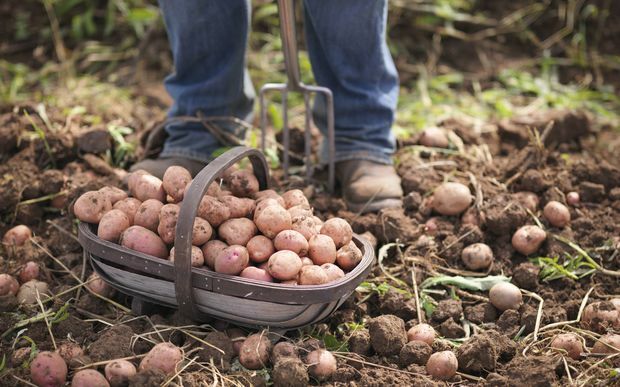 Researchers Dr Charles Merfield said the trials over two growing seasons in Canterbury showed potatoes under the mesh covers had reduced numbers of psyllids, increased tuber size and an increase in overall yield. He says the covers were widely used in other countries and he expected them to become popular in New Zealand. “These mesh crop covers have been in use in Europe for probably nearly two decades now, so they’re very widely used over there for pest control, particularly amongst organic growers, so these strike me as being an ideal way of controlling psyllids on potatoes on field crops. Dr Merfield said the mesh could also control a wide range of pests on many different field crops and was being used by organic growers in Hawke’s Bay to control root fly on carrots.